Columbia Police Chief W.H. 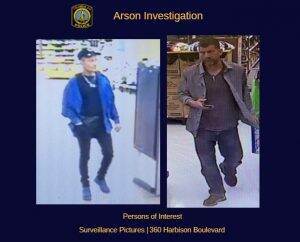 ‘Skip’ Holbrook and Columbia Fire Chief Aubrey D. Jenkins are releasing surveillance pictures of three persons of interest in connection with an overnight fire at a Harbison area shopping center. 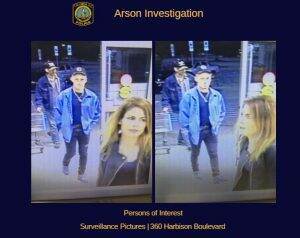 Investigators would like to identify and locate the two males and a female and question them about the incident at 360 Harbison Boulevard. Police and fire crews responded to the Wal-Mart store around 3:30 a.m. on Tuesday, April 16, 2019. At this time, it’s believed that the fire was intentionally set in a food aisle of the store. A few employees and customers were inside the building at the time, and while no one was injured, flames and smoke caused significant damage to part of the store. 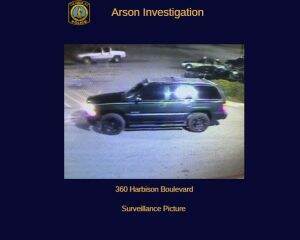 The persons of interest were observed getting out of an older model, green SUV, possibly a Chevy Tahoe or Suburban. Investigators continue to review surveillance video related to the incident.